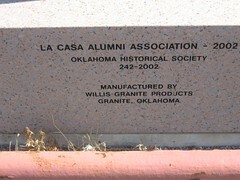 La Casa was located five miles south of this marker. It was formed by consolidating three schools: Mesquite, Star Valley and Bearden. Classes began in a new building after Christmas 1925, with the first graduate in 1928. 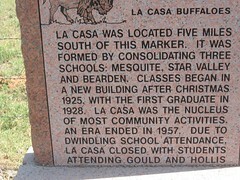 La Casa was the nucleus of most community activities. An era ended in 1957. Due to dwindling school attendance, La Casa closed with students attending Gould and Hollis. 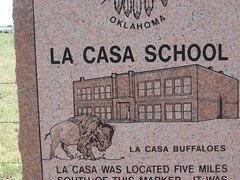 Top of marker: Image of school building and Buffalo school mascot. 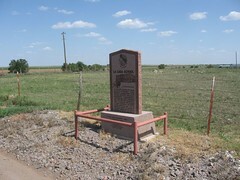 3 miles east of Hollis, Oklahoma on U.S. 62. South side of road.